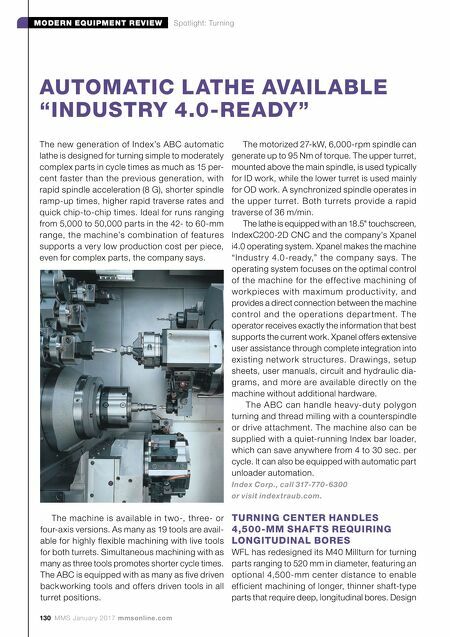 130 MMS January 2017 mmsonline.com MODERN EQUIPMENT REVIEW Spotlight: Turning The new generation of Index's ABC automatic lathe is designed for turning simple to moderately complex parts in cycle times as much as 15 per- cent faster than the previous generation, with rapid spindle acceleration (8 G), shorter spindle ramp-up times, higher rapid traverse rates and quick chip-to-chip times. Ideal for runs ranging from 5,000 to 50,000 parts in the 42- to 60-mm range, the machine's combination of features supports a very low production cost per piece, even for complex parts, the company says. AUTOMATIC LATHE AVAILABLE "INDUSTRY 4.0-READY" The motorized 27-kW, 6,000-rpm spindle can generate up to 95 Nm of torque. The upper turret, mounted above the main spindle, is used typically for ID work, while the lower turret is used mainly for OD work. A synchronized spindle operates in the upper turret. Both turrets provide a rapid traverse of 36 m/min. The lathe is equipped with an 18.5" touchscreen, IndexC200-2D CNC and the company's Xpanel i4.0 operating system. Xpanel makes the machine "Industr y 4.0-ready," the company says. The operating system focuses on the optimal control of the machine for the ef fective machining of work pieces with ma ximum productivit y, and provides a direct connection between the machine control and the operations depar tment. T he operator receives exactly the information that best supports the current work. Xpanel offers extensive user assistance through complete integration into existing network structures. Drawings, setup sheets, user manuals, circuit and hydraulic dia- grams, and more are available directly on the machine without additional hardware. The ABC can handle heav y-dut y polygon turning and thread milling with a counterspindle or drive attachment. The machine also can be supplied with a quiet-running Index bar loader, which can save anywhere from 4 to 30 sec. per cycle. It can also be equipped with automatic part unloader automation. Index Corp., call 317-770-6300 or visit indextraub.com. TURNING CENTER HANDLES 4,500-MM SHAFTS REQUIRING LONGITUDINAL BORES WFL has redesigned its M40 Millturn for turning parts ranging to 520 mm in diameter, featuring an optional 4,500-mm center distance to enable efficient machining of longer, thinner shaft-type parts that require deep, longitudinal bores. Design The machine is available in two-, three- or four-axis versions. 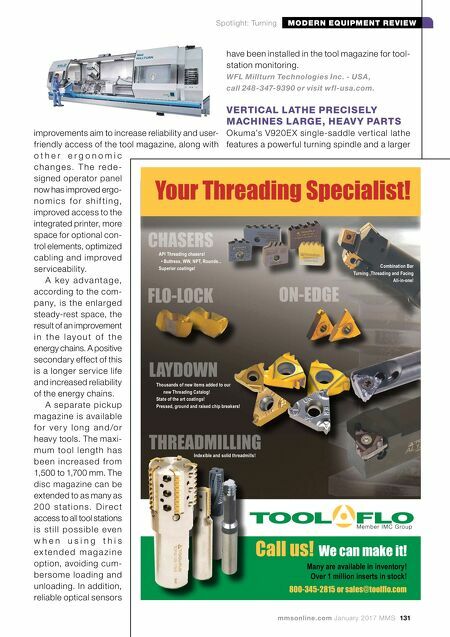 As many as 19 tools are avail- able for highly flexible machining with live tools for both turrets. Simultaneous machining with as many as three tools promotes shorter cycle times. The ABC is equipped with as many as five driven backworking tools and offers driven tools in all turret positions.